Introducing "Meet Me on Mondays"
Meet Me on Mondays is our new feature that will highlight current staff members and individuals who chose our services. DSC is full of truly incredible people and we want to share this information with you, the public! Stay tuned to learn about our staff and consumers, how they became involved with DSC, and that they love about the organization! We will be introducing new individuals on Mondays! Meet Brian Richter, DSC’s Developmental Training Supervisor. Like other employees, Brian never would have guessed that he would end up working at DSC, but his passion for helping others became quite apparent early on in life. While studying business management and sociology at Illinois State University, Brian worked as a restaurant manager and found himself deeply concerned about the personal problems and well-being of the restaurant’s employees. 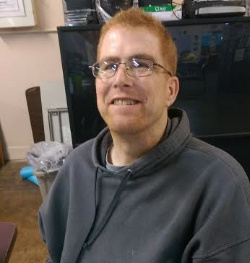 After he graduated, Brian saw an ad in the newspaper for an overnight staff member in a DSC Community Integrated Living Arrangement (aka group home) and decided to give it a shot because he thought he might enjoy it. Sure enough, Brain loved working with consumers in the group home and helping them gain independence. For the next three years, Brian continued to work in the group home, as a Residential Instructor and then an Activity Director. After that, he transitioned to the role of DT Manager, which he has held for almost 22 years! While Brian jokes that he is still working at DSC because his “to-do list is not done,” he loves both his job and the flexibility that working at DSC provides. Working in DT provides a balance between emotional work and structure that Brian finds very fulfilling. In addition to using both sides of his brain, Brian says his favorite part of his job is “the opportunity to challenge assumptions that I am right.” DSC provides the challenging and satisfying work that keeps Brian engaged. The hard work paid off: In 2008, Brian was named the Direct Service Provider of the Year for the State of Illinois! He is an outstanding advocate for the individuals he serves, with his great sense of humor and his zest for life. 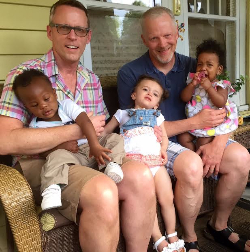 Outside of work, Brian is even busier with his partner, their three adopted kids, and four grandchildren. In the future, Brian hopes to move on to what he calls “Act II,” in which he hopes to transition into part-time contractual consulting work, preferably in a warmer climate! This would provide more time for spending time with family and friends as well as other hobbies such as fitness training, gardening, and watching Netflix. Thomas Billman, a consumer at DSC, recently celebrated his birthday last month, and says that it “just feels great” to be older. That’s the spirit! According to Tom, the only downside to having so many friends come to your birthday party is that there will be hardly any cake left for yourself! During the day, Tom participates in DSC's Day Program, either engaging with other consumers in group activities or completing work tasks. His favorite parts about being at DSC are the great friends he has made through the agency as well as the community outings and involvement, which help consumers interact with and enjoy the Champaign-Urbana community. 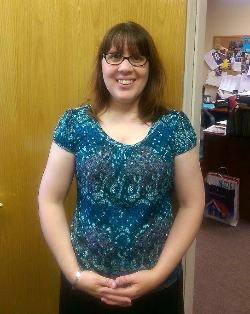 Kelli Martin, DSC’s training coordinator will be celebrating her 15-year anniversary working at DSC! Kelli started out as an occupational therapy assistant at DSC in 2000 and stayed in the role for ten years before transitioning to Training Coordinator. In this position, Kelli teaches training courses for new direct service staff, who are required by state regulations to go through 120 hours of training on subjects such as CPR, abuse and neglect, and crisis prevention. She also teaches refresher courses for current employees, which are required every year or every other year. After graduating from her occupational therapy assistant program, Kelli never thought that she would end up working at DSC. Actually, she was hoping to become a hand therapist at Carle Hospital! Once in the working world, Kelli began to practice in nursing homes but was disappointed in how sporadic and unstable this work setting proved to be. After running into Sarah Perry, an old friend and front desk receptionist at DSC, at a birthday party Kelli took Sarah's advice and looked into work opportunities at DSC. Even though she did not have much experience working with individuals with developmental disabilities, Kelli loved the work immediately. Working with individuals with developmental disabilities became a passion for Kelli and she enjoyed the stability, flexibility, and benefits of working at an organization like DSC. She loved her job so much, she kept her position for ten years! When the position of Training Coordinator became available about five years ago, Kelli decided to make a career transition and took on her current role. Being a training coordinator is a great fit for Kelli since she loves meeting and teaching all new employees and volunteers. In addition to her training duties, Kelli serves on the Behavior Management Committee, which imposes, lifts, and reviews various restrictions placed on consumers as a result of negative behavioral incidents or habits, as well as the Office of the Inspector General Committee, which reviews and assesses accusations of employee abuse or misconduct. Three years ago, Kelli was inspired to start a group called “Learning is Sweet” focused on educating consumers who either have or are at risk for diabetes. Learning is Sweet began with six members and now has about 12 members who meet every other month and learn about diabetes wellness strategies through different visual aids and activities. Kelli hasn’t gotten away from her roots too much, as she still occasionally practices as an occupational therapy assistant and teaches in the Occupational Therapy Assistant Program at Parkland College. What a busy lady! Outside of work, Kelli is active in her church and choir group as well as the president of the Champaign-Urbana Junior Woman's Club, a local community service organization whose members donate time and raise money for other local agencies, including DSC. We are so lucky to have Kelli on our staff and congratulate her on 15 fantastic years!